Building a home can require an overwhelming number of decisions. From picking out paint colors and designing a floor plan to choosing plumbing and electrical fixtures, it is easy to see the challenges of the construction of your new home. Fortunately, selecting the cabinets for your kitchen does not have to be stressful. 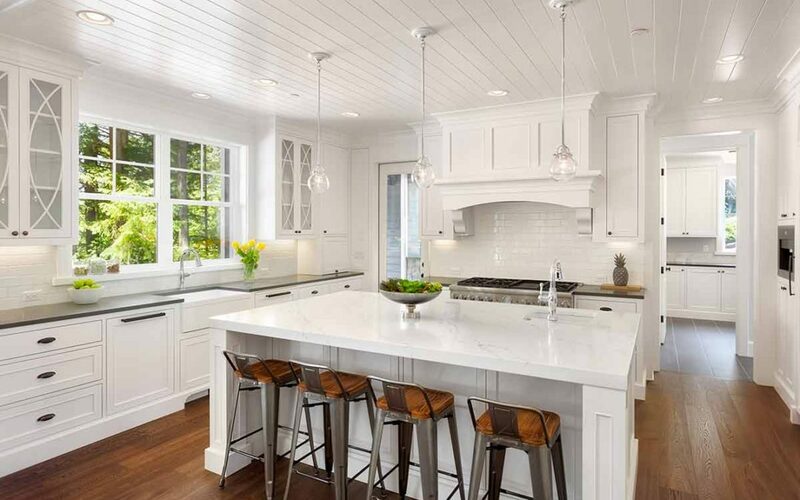 With this guide and the help of the professionals, you will learn a few must-haves to consider for durable, valuable, functional and appealing kitchen cabinetry. The type of wood used to manufacturer your cabinets will be one of the first decisions you will need to make. Hardwoods with a veneer of a different material may be less expensive but carry a risk of warping since moisture is common in the kitchen. When selecting the wood for your cabinets, be sure it is finished on all sides for the ultimate in protection against warping and other damage from moisture. Oak is one of the most popular hardwood options for cabinets. Not only is oak strong and less expensive than other hardwoods, but it can also be stained and finished in a variety of styles. If you prefer a lighter grain and color of wood, consider maple cabinets. Maple can also be stained in a variety of colors, but most people prefer the subtle look of maple cabinets with a clear or natural finish. Cherry wood is another durable option that will stand the test of time. Cherry is a hardwood that can withstand dents and dings, so there is less worry of damaging cabinets in your busy kitchen space. Cherry does darken over time, though, so keep that in mind when choosing the color of your stain. While classified as a softer wood, pine is also used to manufacture cabinets. This pale wood has appealing yellow undertones, but most people love the knotty imperfections that pine offers the most. For strong cabinets that will always be classy and attractive, opt for mahogany. The rich brown color and red undertones of this wood work well with most decorative styles. Since mahogany is becoming rare, this wood will be a valuable addition to your home. If you are like most homeowners, storage is imperative. Thankfully, you can make sure your kitchen offers enough storage space that will help you get and stay organized. When designing your cabinetry, focus on the needs of you and your family. If you do a lot of cooking, make sure your cabinets offer ample space for larger pots and pans. Utilize wasted space of your kitchen by implementing Lazy Susans for storing pots into corner cabinets. Open shelving built into your cabinets will be perfect for cookbooks and decorative accessories. To hide your kitchen waste, make sure you include a cabinet with specialty dividers that hold a trash and recycling can. Equip dividers into your kitchen drawers. These dividers allow you to organize utensils and cooking supplies in a neat and efficient manner. Flat, wide drawers with divided spaces are also beneficial. For easy access, store platters, trays, baking pans and cutting boards in these drawers. Consider a few glass-front cabinet doors if you have collections or antique pieces you would like to display. Place your china, pottery or collections in these cabinets to show off your favorite pieces. Traditionally, the color of your cabinets will be some sort of natural wood stain. Dark or light wood, white and even black are the most common shades used to stain cabinets. Today, more and more people are using newer neutrals. For example, distressed off-white, grey and sage green shades are growing in popularity. If you prefer a slight hint of color, however, consider staining the majority of your cabinets a neutral tone but adding color to your cabinet island. A sage green island will work well with bisque cabinets. Or pair black cabinets with a bright red island for unique style. Designing your kitchen cabinets does not have to be challenging. For more information on cabinet design, contact Huntsville American Cabinets today.